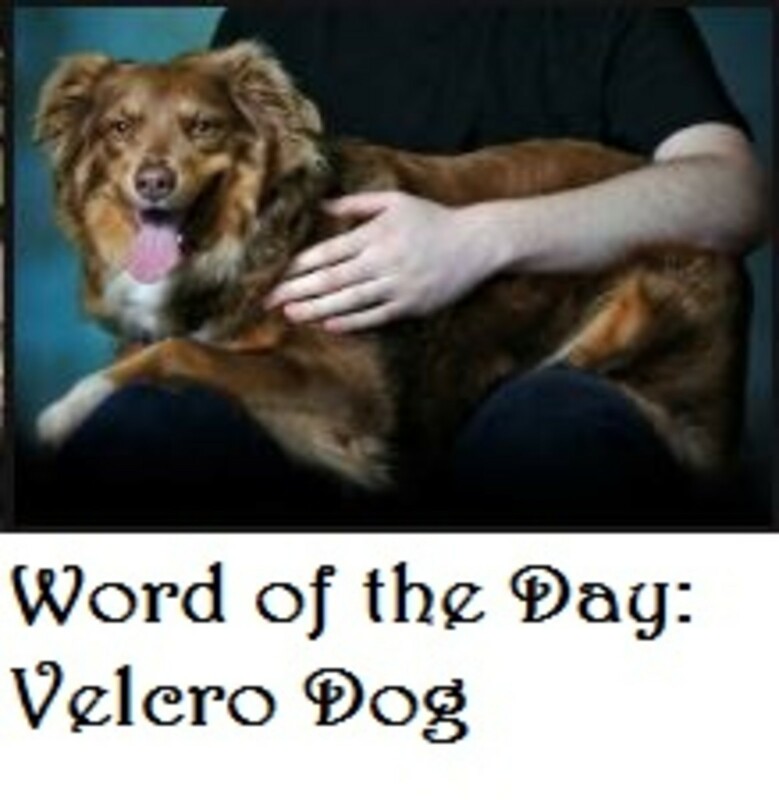 So what exactly is a Velcro dog? A Velcro dog is simply a dog who has developed a strong attachment to his owner, sometimes even to the point of being dysfunctional. Some people like to call these dogs “Velcro dogs” while some others prefer to refer to them as “shadow dogs” because they follow like a shadow. What most Velcro dogs have in common is that they are constantly “underfoot” and will follow their owners or caregivers room-to-room. The typical Velcro dog will often also be hyper vigilant, paying close attention to any cues (like putting down the remote or placing an arm on the arm rest) suggesting that their owners are about to get up and move. Dog owners may sometimes find such behaviors unnerving, especially when their Velcro dogs are small and they constantly risk tripping over them. Let’s face it though: dogs are social animals, and as such, they seek companionship. It’s therefore normal for most dogs (except those few independent breeds) to strongly crave being with their owners and missing them, even when they step away for a brief periods of time. Problems start though when following the owner becomes an obsession and affected dogs are unable to cope with their owner’s absence. Ideally, dogs should be somewhere in between: somewhat interested in their owner’s whereabouts, but capable of relaxing and self-soothing when the owner must step away. Some working dog breeds such as collies and shepherd-like dogs that were selectively bred to work alongside their handlers and that relied heavily on their body language and guidance, may have a hard time dealing with separation. Other dogs with a reputation of being Velcro dogs are breeds bred to hunt with other dogs all day such as hounds and dogs bred to be lap dogs, basically adorable pooches who once spent most of their time as feet and and lap warmers for aristocratic ladies. “Velcro dog status” in hopes of getting their daily dose of exercise and mental activity. These dogs have basically turned following their owners a part-time job and who can’t blame them? The following behavior is often rewarded too when dog owners do interesting activities such as opening the fridge, eating something and leaving several tasty crumbs behind. Sometimes clingy behaviors especially those that start suddenly in dogs who didn’t have this problem, should raise a red flag. In some dogs, this can sometimes be a sign of medical problem. For instance, older dogs may start acting clingy because of deteriorating senses such as loss of hearing or vision loss. These dogs become insecure and by sitting next to their owners they learn to rely on their owner’s reactions to become more aware of happenings around them. Sometimes clingy behaviors may also be an early sign of the onset of canine cognitive dysfunction (doggy Alzheimer’s). It’s not a bad idea to mention behavior changes to the vet, especially if dogs become suddenly clingy and their Velcro dogs behaviors are accompanied by other symptoms. For those folks who own Velcro dogs, there is good news: Velcro dogs can be helped to reduce their “over-attachment.” However, severe cases or dogs suffering from separation anxiety may require professional help and sometimes, medications from a vet or veterinary behaviorist. 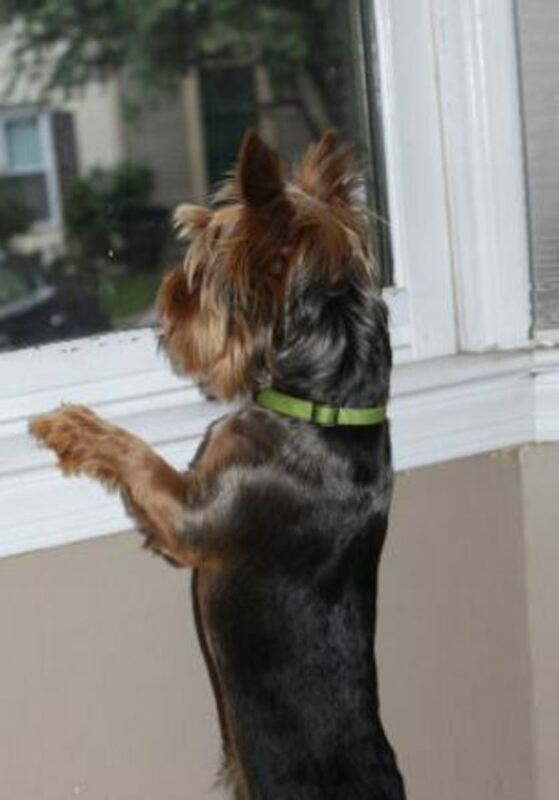 Following are some tips for dealing with a Velcro dog that may help in some mild cases. 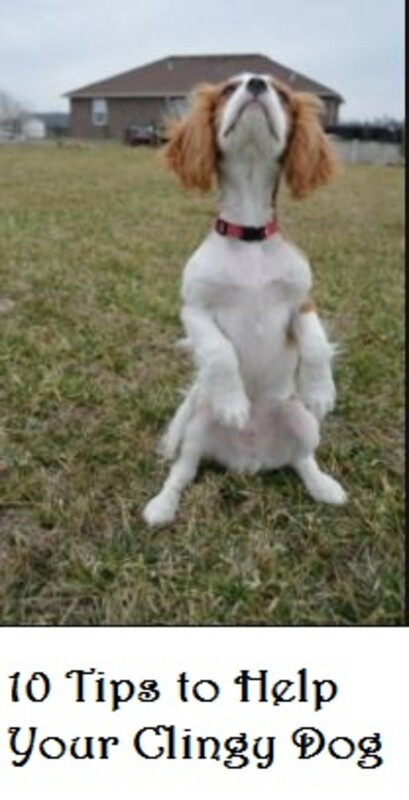 Train your dog a sit stay and down stay and lavishly praise and reward. These obedience exercises aren’t just for training, but can also help for behavior modification as they’re teaching the dog that it can be rewarding to stay at a distance from the owner. It’s important to make the game extra rewarding and fun. Start training your dog with you close-by and then gradually build on distance up until the point your are able to have your dog hold the stay when you are briefly out of sight. Go very gradually though to help your dog succeed as going too fast in the process can be too overwhelming. Also make sure you add closer distances every now and then in the midst of the farther ones so your dog doesn’t come to expect that the exercise will become harder and harder. Train a “go to your mat” cue through a training method known as shaping. Place a mat at a distance from you and click and reward each time your dog walks towards it, then when your dog sniffs it and then when he walks on it. Finally, wait for your dog to lie down on it. When he does, give a jackpot of treats, or even better a stuffed Kong! After your dog visits the mat and lies down on it more and more, put it on cue, by saying “go to your mat” right when your dog gets on it to lie down. Then reward him with a long-lasting Kong to keep busy while you briefly step away. Install a baby gate. This makes for a good temporary measure, but it does not address the underlying emotions nor does it help to boost the dog’s confidence. To help your dog cope better as you go about running errands around the house, toss him a stuffed Kong whilst behind a baby gate to keep him occupied. Prepare your dog’s meal and then place the food bowl on top of the counter so that it builds a bit of anticipation. When your dog appears eager to eat, lower the food bowl and let him eat it while you are a short distance away. If your dog loves toys, place a new toy on the counter and let him have it when you must leave the room. Good things happen only when you are briefly away. Remember to go very gradually. If your dog gives signs of stress and being overwhelmed, you are going too fast in building distance. 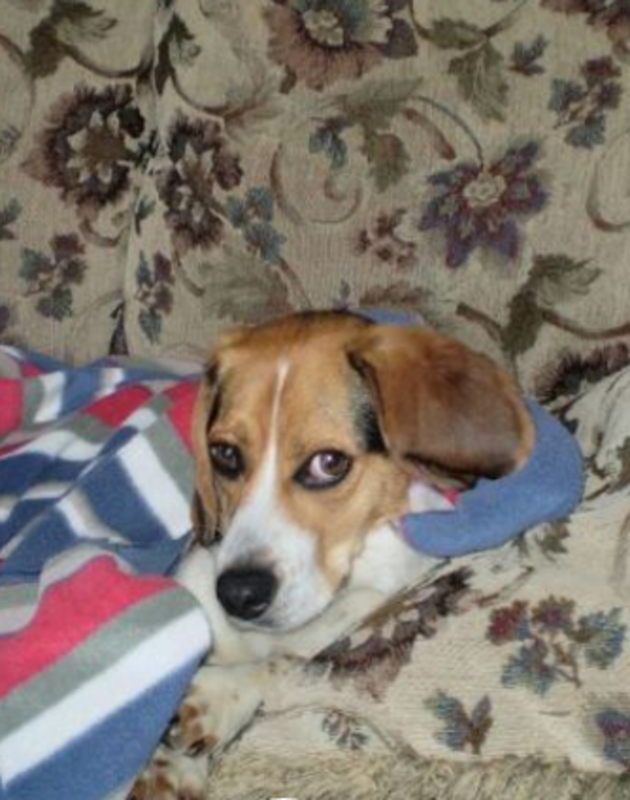 Desensitize your dog to cues that suggests that you are about to get up. If your dog is the type who gets up to follow you upon seeing you put your arm on the arm rest or your chair makes a noise, you might want to to try to desensitize him to these cues. If for example, your dog gets ready to get up the moment you put the remote down, put the remote down over and over without getting up. Eventually at some point, your dog’s senses will tire and he’ll give up responding to this meaningless activity. Reward him by tossing a treat when he settles down (hopefully on his mat) and stops responding to the action. Then, progress and get up repeatedly from the couch. Up and sit, up and sit, up and sit. Again, reward when he stops responding. Progress to getting up, taking a few steps and then sitting down again, do this several times. If your dog follows you, just walk in circles, destination no where and then sit on the couch. Again, reward your dog until he settles and stops responding. Do this until you can get up and go into another room and your dog stay put on his mat. Teach your dog to sleep at a distance from you. Provide him with a mat that you keep initially at a small distance from you. Many clingy dogs like to sleep by our feet or right next to us on the couch or bed so we awaken them when we are about to get up. These dogs are afraid to fall asleep as they cannot keep track on where we are, so teaching them to sleep on a mat with a chew toy can help instill some independence. Clingy dogs need a confidence boost. Always use positive training methods and make it fun and rewarding. Train them confidence boosting exercises such as agility, free-shaping, basic obedience and clicker training. Train tricks and games that use distance. Fetch, hide-n-seek, “go get the beer from the fridge” or “go go get the mail” can be fun and rewarding activities for a Velcro dog. Make sure your dog gets his daily dose of exercise and mental stimulation. A tired dog is less likely to want to follow you around the house all day. Veterinary Practice News: Separation Anxiety, Try 4-step Program, retrieved from the web on July 6th, 2016. Wikipedia, Velcro, retrieved from the web on July 6th, 2016.